Biosensors produce complex outputs which we interpret using machine learning algorithms. 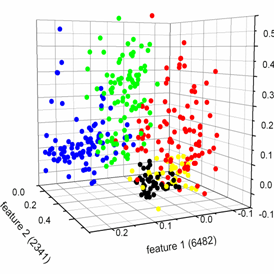 We can then visualize grouping of data based on patterns of biomarkers from the original samples. Thank you for taking the time to look through our total published work over many years. This page lists the comprehensive total of all of our published work. We publish in several different discipline areas, and we also provide links to sub-categories of our work for easy reference (listed below). To view our published work on non-invasive breath analysis, please click HERE. To view our published work on agriculture monitoring, please click HERE. To view our published work on instrumentation and novel sensor development, please click HERE. To view our published work on algorithms and data analysis, please click HERE. Hichwa PT, Davis CE*. (2018) Chapter 12: Modern application potential of miniature chemical sensors. Sensors for Diagnostics and Monitoring (editors Yallup K, Basirico L, Iniewski K), CRC Press, Taylor and Francis Group. pp. 283-302. ISBN: 978-0-8153-7020-8. Schivo M, McCartney MM, Yamaguchi MS, Borras E, Davis CE*. (2018) CHAPTER 5: Bottom-up cell culture models to elucidate human in vitro biomarkers of lung infection. Volatiles Metabolomics Analysis in Biomedical Diagnosis Applications (editors Cumeras R, Correig X), Apple Academic Press, Inc. pp. 105-122. ISBN: 978-1-7718-8744-1. Filipiak W, Mochalski P, Filipiak A, Ager C, Cumeras R, Davis CE, Agapiou A, Unterkofler K, Troppmair J. (2016) Arriving at the human volatilome: A review of volatile organic compounds (VOCs) released by different cell types. Current Medicinal Chemistry 23: 1-20. Zamuruyev KO, Zrodnikov Y, Davis CE*. (2016) Photolithography-free laser-patterned HF acid-resistant chromium-polyimide mask for rapid fabrication of microfluidic systems in glass. Technical Digest: Solid-State Sensors, Actuators, and Microsystems Workshop 2016 Hilton Head, SC, USA. 05-09 JUN 2016. pp. 172-175. Hunter GW, Dweik RA, Makel DB, Grigsby CC, Mayes RS, Davis CE. (2016) Portable Breath Monitoring: A New Frontier in Personalized Health Care. Electrochemical Society ECS Interface Magazine 25(4): 63-67. Godfrey K, Araujo K, Vidalakis G, Slupsky C, Davis CE, Leveau J, Hajeri S, Jin H, Keremane M. (2016) Are Early Detection Methods for HLB Impacted by the Presence of Citrus Stubborn and Citrus Tristeza Diseases in California? Citrograph 8(2): 48-50. Katzenmeyer AM, Bayam Y, Logeeswaran VJ, Pitcher MW, Nur Y, Seyyidoglu S, Toppare LK, Talin AA, Han H, Davis CE, Islam MS*. (2008) Poly(hydridocarbyne) as a highly processable insulating polymer precursor to micro/nanostructures and graphite conductors. The 8th International Conference on Nanotechnology 1: 1-3. Morgan JT, Davis CE*. (2006) Differential mobility spectrometry applications in homeland security, clinical diagnostics and drug discovery. 2006 ASME International Mechanical Engineering Congress and Exposition. November 5-10, 2006, Chicago, Illinois. IMECE2006-15937. Blain-Christen JM, Davis CE, Li M, Andreou AG*. (2002) Robust Polymeric Techniques for Design, Post-processing and Packaging Arrays of Bio-MEMS Devices. Proceedings from The Tenth Meeting of the Symposium on Polymers for Microelectronics. Vol 1: 700-703. Blain-Christen JM, Davis CE, Li M, Andreou AG*. (2002) Design, double sided post-processing, and packaging of CMOS compatible bio-MEMS device arrays. Circuits and Systems, 2002. ISCAS 2002. IEEE International Symposium on Circuits and Systems. Vol 1: 665-668.